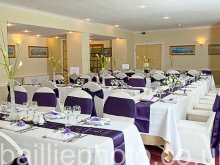 Creebridge House Hotel - Hosting your Event. Here at the Creebridge House Hotel we know that it's important that everything be well prepared and organised for that special day or event, which is why we have a dedicated hotel manager and staff at your call whenever you need them to arrange any last minute ideas. All our staff are well trained to a high standard and will do their best to help you in any way they can. Please ask for their assistance at any time, we're always available to help! 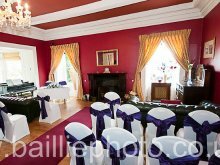 For weddings at the Creebridge House Hotel we can provide everything you need. From arranging the ceremony in our Drawing Room or Garden to the finest of details such as cakes, flowers, name places and table plans. Our dedicated staff are on hand to help at anytime. The hotel boasts a newly redecorated function room overlooking our beautiful gardens. We can seat up to 70 people for a sit down wedding breakfast, with a further 80 people for the evening reception. Should you be thinking on a larger scale we can cater for a marquee on our lawn for up to 120 people. Please contact us now for wedding package information. Let us take the stress out of the organisation and assure you that your special day will be an event to remember. Satisfaction is assured! Planning a company conference, exhibition or dinner function? Then look no further than the Creebridge House Hotel. The hotel is ideal for hosting a variety of events. Our main function room can seat over 50 people, with smaller rooms available to suit fewer numbers. Flexible packages mean that we are able to cater for your exact needs. Simple soup & sandwiches, to elaborate fork buffets, 24hr or Day delegate prices, or just room hire, we can provide an excellent service.